When a market-leading hire company discovers that its competitors are gaining ground, it’s time to act. Add to that customers’ increasing lack of awareness of essential health and safety requirements relating to the equipment hire industry and urgent action becomes imperative, if market share is to be maintained. Prior to its acquisition by Speedy Hire plc, Lifting Gear Hire* (LGH) was the UK’s leading independent hirer of lifting equipment to the on-shore market. LGH had introduced the rental concept for lifting in the UK in 1970 and led its competitors in important areas of business performance thanks to its UK branch network, comprehensive in-depth product range and service quality. However, 35 years after its inception, reliable marketing research studies revealed that the perceived value gap between LGH and its competitors was narrowing. Additionally, despite government statistics revealing an alarming rise of over 50% in major injuries resulting from lifting and handling, it had become apparent that some customers had become blasé about the potential hazards associated with lifting and were unaware of the risks of using suppliers who didn’t maintain their equipment properly or possess adequate levels of public liability insurance. The need to raise awareness levels resulted in the ‘Risk’ campaign, formulated by Communisage founder, Mike Cowburn and his marcomms team, to reposition Lifting Gear Hire as the specialist lifting equipment provider best placed to help customers avoid the risks and potential hazards associated with lifting and a market leader with real value differentiation compared with its competitors. – and promoted Lifting Gear Hire’s strengths and benefits. 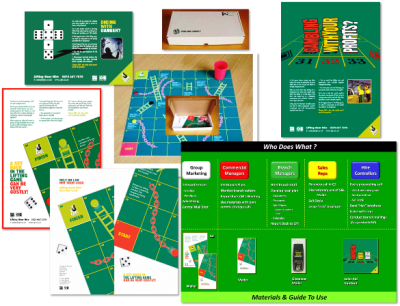 Impact and recall were secured by use of a wide range of emotive gambling images and metaphors to convey key messages. Associated delivery of campaign logistics management, client stakeholder briefings and an in-depth internal marketing campaign fulfilled a crucial role in a successful campaign. As a result, LGH maintained revenue stability of a £20m operation.